The stock sway bar end links on a 3rd Gen are pretty pathetic. The combined play on each link is over an inch, not good. 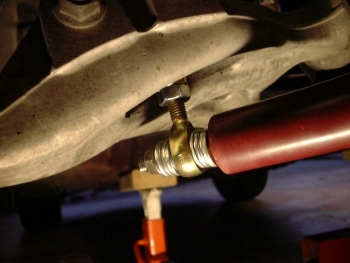 Tri-Point replaces the stock end links in their front sway bar kit with rod ends so I just followed their lead. 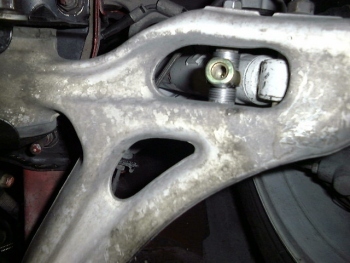 NOTE: Make sure your sway bar mounts are not cracked before you do this mod. My little theory on this is that the stock end links "wind up" when transitioning from left to right and then slam into the frame and mounts causing in cracks in one or both. So what do you do? Call a local bearing distributor and get two male and two female rod end links with 10mm "eyes" or whatever they call those holes in the end. Mine were Aurora PN MW-M10T and MM-M10T and cost about $12 each for a total of around $53 with taxes. Make sure you get 10mm washers as well, good ones are like $.09ea and you need about 50 total. 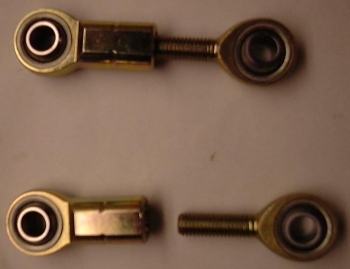 Use one of each rod end to replace each stock link. 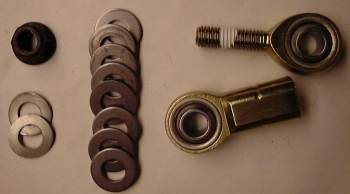 You will need some washers or spacers to make up the difference in width between the stock end link and the new rod ends. I put some spring washer on the sway bar end, don't ask why, it seemed like a good idea at the time. You can't put spring washers on the end that goes into the lower control arm, it needs to be as tight as possible to keep from moving from side to side and chewing up the lower control arm. A very small amount of good quality grease between each washer should keep them from ever requiring replacement. The rod ends I purchased are Teflon lined and should not require any other lubrication. The lower control arm end has been tightened and is very solid. 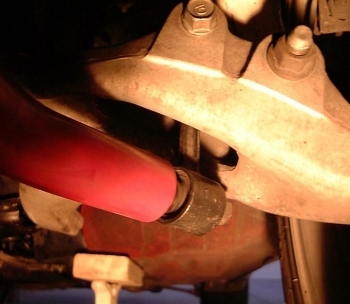 The sway bar end shown is only on hand tight. When tightened it too becomes very solid with the spring washers getting totally flattened. The white paint on the male rod end indicates how far to turn it into the female rod end when installing it. 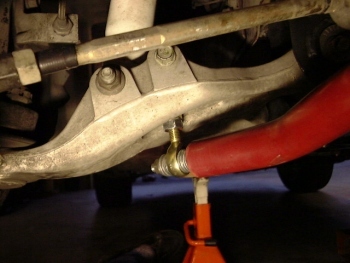 The end result a sway bar that is basically "at one" with your car. The bar, be it stock, Eibach, or whatever will be able to do it's job a little bit better.